like a parrot perched on the shoulder of a pirate, I stand perched on a bare rocky ridge on the bony skeleton of Mt Thielsen. Then I drop over the ridge top down to Thielsen Creek one of only two water sources in this entire stretch of the PCT. I find Shaggy, Blue Moon, Clawhammer, and Beeline down by the water. The creek comes rushing down the hill from the mountain above. It's cold in this little valley. At the water contributes to that. It's so cold it makes my hands hurt just holding my containers under the cascades to fill them. The sun is blazing and brilliant, the shade cool and inviting. I elect the shade, and drop my pack. I drink my customary one liter and pack my customary two and three quarter liters. The three quarters comes from the three quarter liter water bottle I carry. 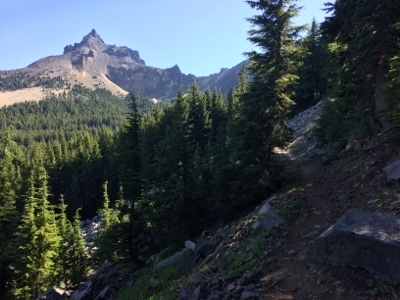 Today's trail takes me up and over the PCT high point for Oregon and Washington. A pass that I cross looking over my shoulder at clouds that seem to be building ominously in the west. Today is windy, giving me an anxious feeling of underlying unsettledness. I hike on and on along ridge tops as the sun slowly moves further and further towards the western horizon. The wind blows and gusts causing needles to fall like snow from the trees. I feel exposed and unprotected. What is it about the wind that makes me feel this way? I think back to my childhood in San Francisco. Wind like this was an everyday summer day occurrence. By two or three in the afternoon the wind would be blowing maybe twenty knots gusting to thirty. We had a big blue gum eucalyptus tree in the backyard that would bend and sway. It's long leathery leaves would slap together like so many hands that the tree sounded like a striking filled with cheering fans, or an entire forest like this. I remember lying in bed at night looking up at the oddly positioned louvered window in the top corner of my high ceilinged bedroom. The shadow of a wolf baying at the moon would sway back and forth across its panes in concert with the tree outside backlight by some distant light. I remember the feeling of vulnerability as my imagination pictured the wolf springing through those panes and entering my room. I remember falling asleep by hiding my eyes under the covers or better yet, convincing my mom to leave the stove light on in the kitchen outside my bedroom door. I slept with the door open to the light. The wolf would avoid the light. The light saved me from the darkness where the wolf’s motions could be seen. I arrive at the junction with the trail to Six Horse late in the day. I have saved enough water to cook dinner but I'll need to hike down the trail to the springs before leaving to have enough water to reach the next water. That's about a three quarter mile round trip down and back up that steep trail. I see Batdance and Rockbiter there along we some other thru-hikers. We chat and laugh a bit before I choose a spot to setup my tent. I am exhausted, I don't have the energy to keep up thirty miles day after day. My feet are so tired and sore I can't wait to get off of them. The wind is still blowing gustily and I have that underlying feeling of unsettledness driving me to want to be inside and out of the wind. I use the last of my water to cook dinner. I peer through the canopy and out to the west. The clouds are coming from there. Are they growing and building? Are coming this way. Maybe, maybe it'll rain. It is the Northwest. I look at my tent set up. It's then that I notice I have set it up in a little depression. A depression that'll make a three or four inch deep puddle if it decides to rain. I am too tired to move my tent. I hope it doesn't rain. That might be wishful thinking, this is the northwest. After my chores I climb into my tent. The other disadvantage of this concave camping spot is that no matter how I try to lay, I can't seem to get comfortable. I toss and turn as the night settles in around me.darkness without a moon envelopes the ridge I'm on. The wind rushes and roars intermittently and the trees sway and needles fall like snow. There is another sound. A sound of dripping, landing on my tent. What is it? Not enough to be rain. Condensation off the trees? Sap? Drip, drip, drip. I drift off and sleep the unsettled sleep of the uncomfortable.